Just two weeks ago I wrote to you saying I believed Oaktree Capital Group (OAK) presented a great buying opportunity as a “hedge” against future stock market volatility. My plan was that Oaktree — with its near 7 percent dividend yield — would be a stock that could be held for the long term. Instead, just one week later Oaktree announced that it was being acquired at a healthy premium to the current share price. I guess this is goodbye to our portfolio hedge and hello to a very quick capital gain! Brookfield Asset Management (BAM) is the company that is acquiring Oaktree. The purchase price is a 15 percent premium to where the stock traded when I wrote about the business. Oaktree shareholders have the option to take the $49 offer in cash or in shares of Brookfield. 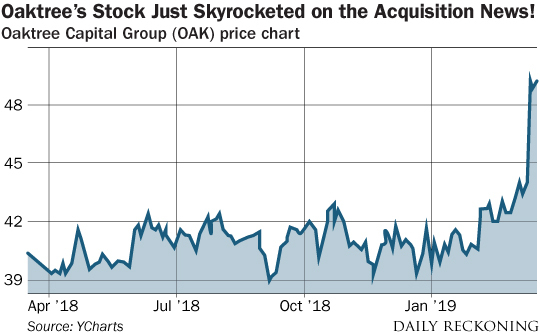 Oaktree has actually been trading slightly above the $49 offer price subsequent to the announcement, so shareholders who prefer cash can sell now and lock in this slight premium. If cash is your preferred option, then congratulations on the quick stock market win! My original thesis behind owning Oaktree was that as a distressed asset investor, the Oaktree business is countercyclical and thereby thrives when the economy and stock market suffer. That is what would have made Oaktree a useful “hedge” against turbulent times for your portfolio. All is not lost on that front, however. I believe that if you decide to accept Brookfield shares instead of cash in this transaction, you will still be very much an owner of a company that is a good portfolio “hedge” against turbulent times. This transaction involves combining Oaktree’s $120 billion of assets under management (AUM) with Brookfield’s $350 billion of AUM. That means that the countercyclical Oaktree business is still one-third of the business post-transaction. More importantly though, I believe that Brookfield post-transaction will be a superb company to own for the long-term through all economic cycles. While Oaktree is focused mostly on distressed credit opportunities, Brookfield specializes in the management of “hard” assets. By hard assets, I mean real estate (office, retail, multi-family), infrastructure (toll roads, ports, railways), and renewable energy (hydro, wind, solar). 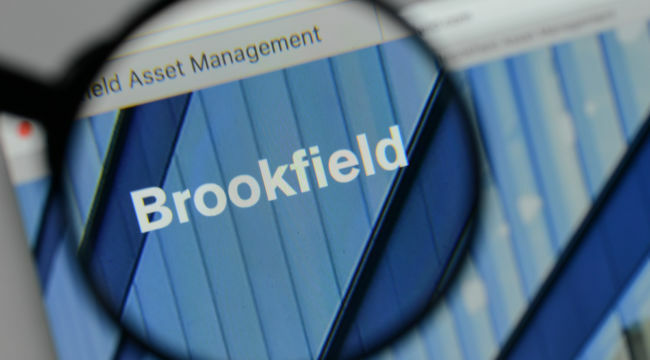 Like any asset manager, Brookfield receives a fee for investing capital on behalf of its clients. Where a typical mutual fund manager would invest that capital into stocks, Brookfield invests in and operates the hard asset classes I mentioned above. And by the way, Brookfield invests that capital very well, having generating an annualized 19 percent rate of return since the late nineties. That performance crushes the S&P 500’s 7 percent over that time and U.S. Treasuries’ 4 percent return. The driving force behind those superior investment returns is Brookfield’s CEO Bruce Flatt who has infused this company with a contrarian investment mindset. Flatt loves to go against the grain and can usually be found buying assets that are decidedly out of favor. No wonder then that he has often been referred to as Canada’s Warren Buffett. 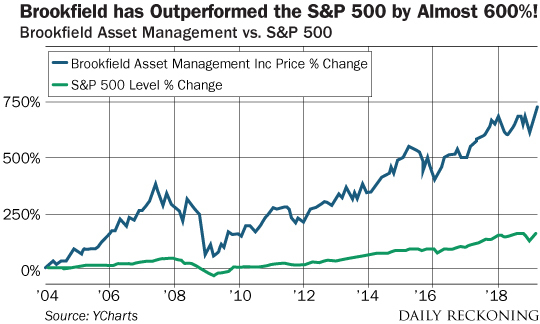 Since Flatt took over Brookfield as CEO in 2004, the company’s share price has widely outperformed the S&P 500. Now, with the Oaktree business as part of the company I expect those outsized returns to continue for years to come. You can sell Oaktree today and pocket a nice short term profit. Or you can take Brookfield shares and do very well for years to come. I think we win either way!